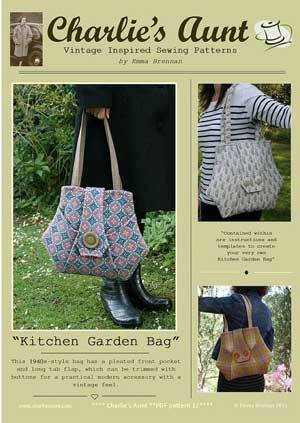 The Kitchen Garden Bag Pattern is a PDF bag pattern that is inspired by the 1940's styles with a pleated front pocket and a tab front flap. 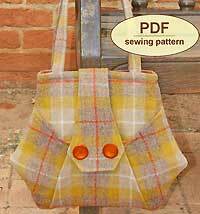 The Kitchen Garden Bag Pattern is inspired by the 1940's and has a pretty but practical deep pleated front pocket, and a long tab flap which is decorated with vintage buttons. 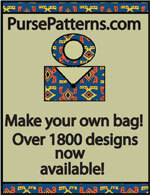 This PDF bagpattern also has a template for an interior zip pocket. Finished size is approximately 13” (33cm) tall 16” (41cm) wide excluding handles. 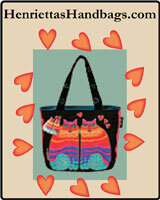 This PDF pattern has 16 pages – 8 pages including photographs, detailed instructions and illustrations, plus 8 pages of full sized pattern templates which you must print on letter (8 1/2" x 11") paper and cut out. Many of the pieces are too big to fit on one sheet so you will have to tape them together after you have cut them out.